TAGES, developed by MPO and Thomson-CSF, is based on the latest technologies for the manufacture of discs and the development of anti-copy digital processes. TAGES can be implemented at various stages of software development and its anti-copy functions can be customized to meet the specific needs of developers and publishers. TAGES enables you to choose how the protection affects unauthorized copies, from slightly modifying to completely blocking the functioning of the software. It is completely transparent to the end-user and does not require any specific set-up or on line transaction before launching the protected software. 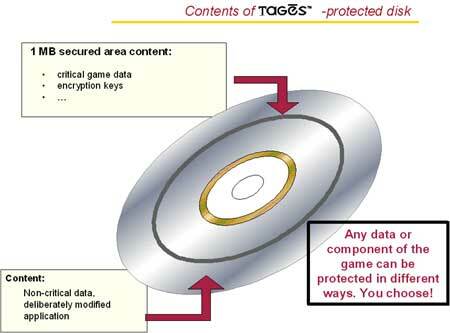 TAGES uses new encryption and authentication technologies compatible with standard multi-media PC computers and drives.